Hoppin' John is a classic southern dish made with black-eyed peas, rice and flavored with ham or bacon. 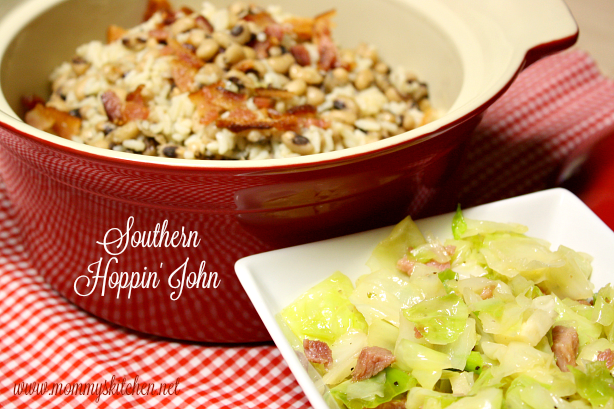 Hoppin' John is also a traditional southern side dish served on New Years Day! 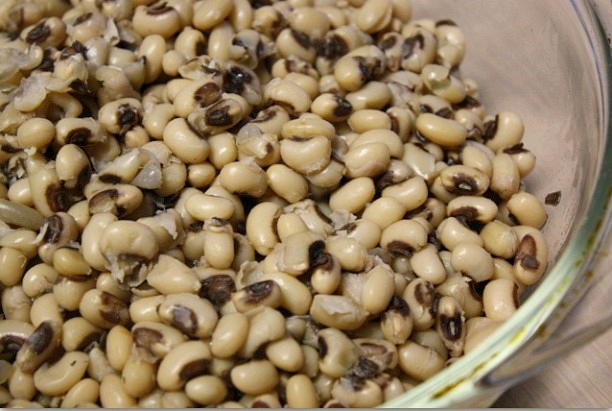 Eating black-eyed peas on New Years Day is a long known southern tradition to bring forth good luck for the new year. 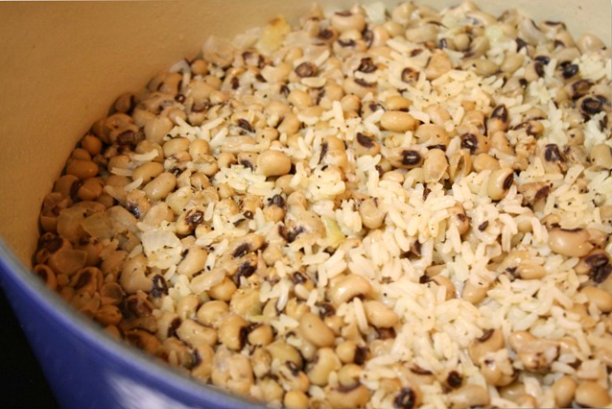 Every New Years Day in my house, we eat black-eyed peas or Hoppin' John, cabbage and cornbread. Each dish represents something special: peas for good luck, greens or cabbage for prosperity and cornbread represents gold. Some folks will say that you have to eat all or none for the good luck to stick, because they all work together or not at all. I don't ever want to tempt fate, so every New Year's Day we eat black-eyed peas, cabbage and a big skillet of cornbread. 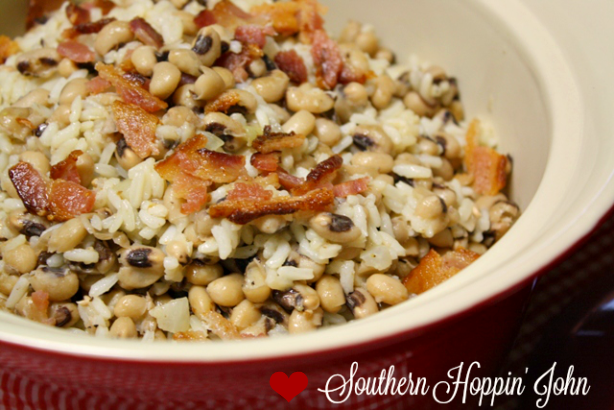 Hoppin' John is a family favorite dish made with black-eyed peas, rice and flavored with ham or bacon. Beans and ham are a traditional pairing in the south, so a leftover ham bone from your Christmas ham is perfect for this recipe. If you don't have a ham bone you can also use a smoked ham hock purchased from the meat department at your local grocery store. 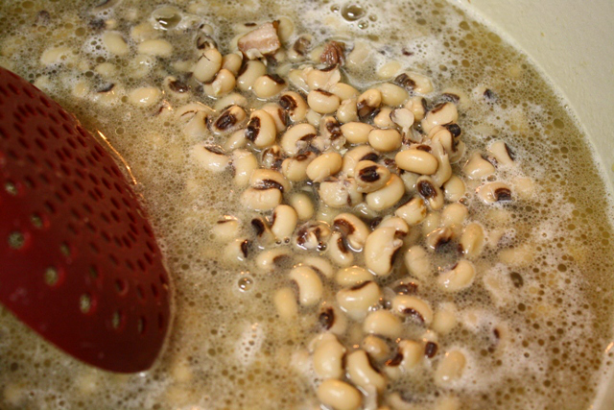 So everyone let's celebrate the New Year in true southern style with some black-eyed peas or Hoppin' John and don't forget the greens or cabbage and cornbread. Whether or not these dishes bring good luck and wealth in the coming year, it's still a fun tradition in our family. I hope you'll give this recipe a try! To start place the dried black-eyed peas in a dutch oven or large soup pot. Add enough water to cover the peas by 2 inches. Let the peas soak for at least 6-8 hours or overnight then discard the water. Add about 7 cups fresh water to the soaked peas. Add the ham hock or ham bone, one bay leaf, salt, pepper and a couple shakes of Cajun seasoning. Bring the mixture to a boil, reduce heat to medium-low and simmer peas (slightly covered) for about 2 hours or until peas are tender. When the peas are cooked, drain the water and remove the bay leaf, add the peas to a bowl and set aside. Set the ham hock or ham bone aside as well to cool. 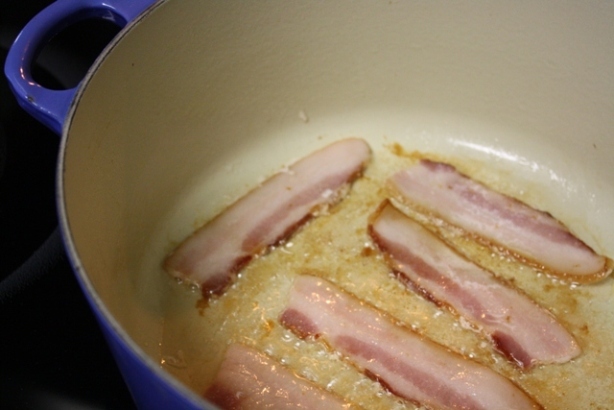 In the same Dutch oven, cook the bacon in a large skillet until crisp. Remove bacon and drain on paper towels, reserving bacon drippings. Crumble bacon. Saute the onion, celery, green bell pepper (if using) and rice in the hot drippings over medium heat for 4-5 minutes. Make sure to watch the mixture carefully so the rice doesn't burn. 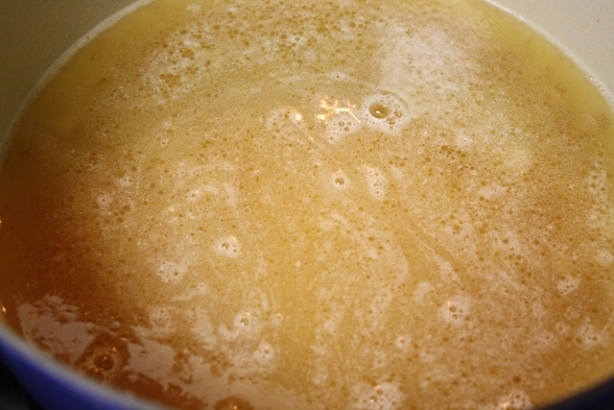 Add 3 cups chicken broth, pepper and additional Cajun seasoning to taste. Add the black-eyed peas back to the dutch oven. Pull off any meat from the ham hock or ham bone and add that back to the pot as well. Mix to combine. 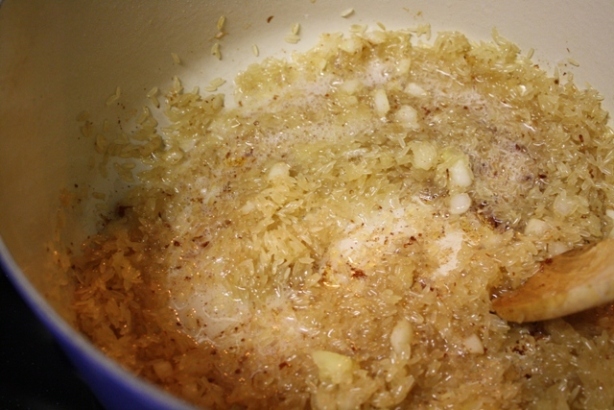 Cook covered over medium heat until the rice is tender and the liquid is absorbed (about 20 - 25 minutes). Remove from heat and and let stand covered for 10 minutes before serving. Add the crumbled bacon over the top of the Hoppin' John and spoon into bowls. Garnish with hot sauce, pepper vinegar or chow chow relish. 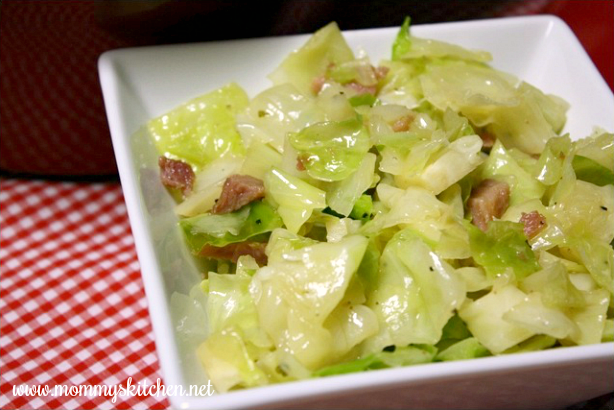 If you would like to serve your Hoppin' John with pan fried cabbage, I have included the recipe. I'm also sharing the link to three cornbread recipes, Pepper Jack Cornbread, Mexican Cornbread and a Sweet Corn Cake that would pair perfectly wit this meal. Place the dried black-eyed peas in a dutch oven or large soup pot. Add enough water to cover the peas by 2 inches. Let peas soak for at least 6-8 hours or overnight then discard the water. Add 7 cups fresh water to the soaked peas. Add the ham hock or ham bone, one bay leaf, salt, pepper and a couple shakes of Cajun seasoning. Bring the mixture to a boil, reduce heat heat to medium-low and simmer peas (slightly covered) for 2 hours or until peas are tender. Drain peas, remove and discard bay leaf, add the peas to a bowl and set aside. Set the ham hock or ham bone aside as well to cool. In the same Dutch oven, cook the bacon in a large skillet until crisp. Remove bacon and drain on paper towels, reserving bacon drippings. Crumble bacon and set aside. Add the chicken broth, pepper and additional Cajun seasoning, to taste. Add the black-eyed peas back to the dutch oven and pull off any meat from the ham hock or ham bone and add that back to the pot as well. Mix to combine. Cook covered over medium heat until the rice is tender (about 20 - 25 minutes). Remove from heat and let stand covered for 10 minutes before serving. Add the crumbled bacon over the top of the Hoppin' John and spoon into bowls. Garnish with hot sauce, pepper vinegar or chow chow. I hope everyone has a happy, healthy and joyful New Year! We do these same recipes! Black Eyed Peas = luck for the year and Cabbage = money!! WOO! I love hearing about holiday traditions. Have a great holiday weekend!